Me…Jane by Patrick McDonnell. Little, Brown and Company, 2011. Currently available. Face Value: Little Jane is just the cutest thing, and she and her stuffed chimpanzee are front and center. This cover is charming and beautiful. It combines the cartoon styling and the vintage inspiration that makes the artwork in this book so unique. I especially love the expressive eyes on the animals in the background (although the lion looks like he may have just had an accident). Does it break the slate? Yes! It is subtle, because this book is a quiet little story that would work well for one-on-one reading and cuddling with young readers. Although little Jane in the story is darling, she grows up to be a tremendously slatebreaking woman. I loved watching young Jane pursue her dreams and then wake up to see that they had come true. 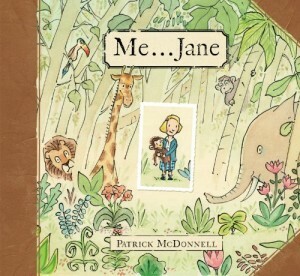 How terrific to have a picture book showing an adventurous little girl who grows up to be Jane Goodall, a huge influence in the scientific field. Who would we give it to? This book is perfect for young animal lovers, or girls and boys with a sense of wonder about the natural world. If you have an outdoorsy type for a friend, and that person happens to have a kiddo, this would be a lovely gift for them to share with their child. Review: Everything about this book screams “cute”. My partner saw it on our coffee table, and as he picked it up and read it, he said, “Awwwwwww! That’s lovely.” And that pretty much sums up Me…Jane. It is utterly lovely. It is so sweet in it’s simplicity that you cannot help but smile while reading. But there are lots of charming, adorable picture books out there – so what sets Me…Jane apart? It is the unity of the design, and the true story behind it, that make this book stand out. Patrick McDonnell is the artist behind the MUTTS comic strip. His artwork is immediately recognizable, mostly in the facial expressions of the people and animals he draws. McDonnell’s gift with expressions is brilliantly showcased in this story. My very favorite example of this mastery of expression is when Jane goes into the chicken coop to see where eggs come from. As the chicken enters the coop, Jane watches wide-eyed. Her mouth is not drawn in this picture. Then, on the next page, as she “observes the miracle” and sees how the egg pops out, little Jane’s mouth appears as a tiny, round “o,” perfectly capturing the surprise and wonder of that moment. The book also combines McDonnell’s original artwork with ornamental engravings from scientific texts of the late nineteenth and twentieth centuries. The balance of old and new is handled beautifully, with the engravings lingering behind the text and McDonnell’s illustrations prominently illustrating the action from Jane’s childhood. I thought this was a lovely touch. 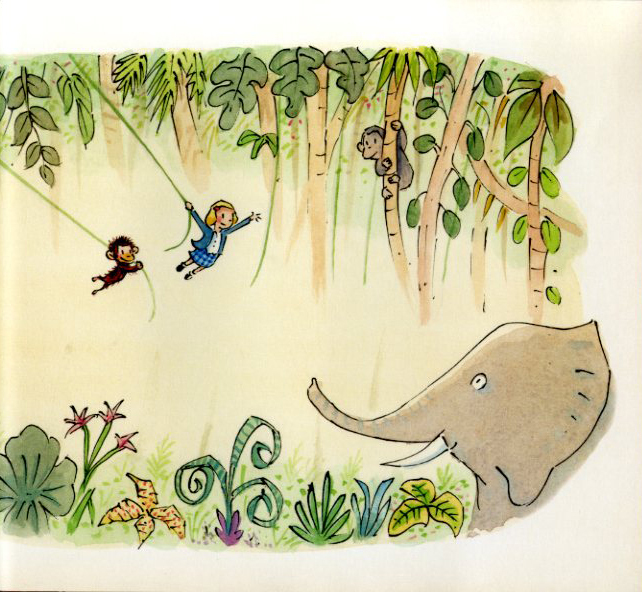 There is also some of Jane Goodall’s own artwork included in the text. What makes this book so magical is that it captures the essence of a biography with so few words. Rather than exhaustively chronicling the details of Goodall’s childhood, it highlights a few key moments that guided Ms. Goodall down the path to her career. There are just a few words on each page, and the text and pictures share the job of moving the narrative along. A young reader may not know right away that this is a real story, but when we turn the final page we see a photograph of the adult Jane Goodall reaching out to a baby chimpanzee. There is an element of surprise at work, because it is the first photograph in the text. It makes for a very satisfying reveal at the end of the book. This book is a winner not just for its composition and artwork, but because it tells the story of a truly magnificent woman. I’m not really an animal lover, but I appreciate the magnitude of all that Jane Goodall has done to promote global conservation efforts and peace among humans. She is a fascinating woman who broke through many barriers, and embodies the slatebreaking spirit. With the many messages in our culture telling girls that they aren’t good at science and math, a story about Jane Goodall is a refreshing and welcome change. This entry was posted in Picture Books, Reviews and tagged chimpanzees, Comics, Jane Goodall, MUTTS, Patrick McDonnell, picture book. Bookmark the permalink.